Diary of a 3000 Year old Witch! Leyanne felt the breeze lifting the layers of her tunic top up from her legging-clad thighs, always one to dress the part of ancient witch with layers and jewellery, her eyes closed and facing the sun she was listening intently to the sounds of her ravens in the nearby trees. The ravens always a constant in her travels, her protection, her companions but yet today something was different among their crony calls. A new voice among them. Jangling the bangles on her right arm she sent out a vibration across the ground and towards the trees, her eyes remaining shut she visualised among them the single bird which had dared to encroach on her brood without invitation. Cutting through black feathers, raven claws, leaves and beaks her mind’s eye came to rest on a surprising sight. A white as snow raven with blood red eyes and a beak the colour of ivory. So her new addition was somewhat of a sign, maybe a warning and now he had her attention fully she beckoned him to come to her. Opening her eyes and twisting her fingers in mid air she cast the net and pulled him close. The bird had no resistance to her magic and flew to her hand immediately, a good sign that he was not enchanted, his eyes narrowed upon her face and the deep darkness of her eyes. ‘What do we have here?’ she smiled and turned her hand to admire the pure feathers of this new animal before her. ‘Do you have a secret little bird?’ smoothing down the birds silky plumage with her free hand she focused on the memories it held and it’s purpose for its arrival, she found nothing but shadow within its mind. ‘Someone is protecting you from me’ she smirked. Not at all phased by the realisation that this little animal was a spy. ‘At least they didn’t try to hide you…. I wonder what they imagine I’m doing that is worth spying on’ she laughed to herself as she jerked a feather from his breast with her fingertips sending the bird on it’s way, she sensed no danger or foreboding even if he was laced in witchcraft, a white witch no doubt and the irony of his colouring was not lost on her. ‘So friend or foe, you have a sense of humour’ she said aloud knowing now that ears were most definitely listening as her new white friend had nestled back among her brood. ‘There is one thing you should know about me…I’m not someone you should get on the wrong side of, there are no protection spells or rituals on the face of this earth which would save you from me’ with a smile and turning full circle of the wooded area around her in the small forest she again closed her eyes holding the feather between her fingers to channel its source. Her thoughts raced across the grass strewn forest floor to the south, her mind like a running animal tripping over fallen logs and snapping twigs in it’s haste to get to its destination. Heart pounding in her ears as she gained speed. She crossed roads, rivers, land and highways at a rate of light and speed before her mind halted on a cottage hidden in the depth of the darkest part of a forest and met the face of a long ago seen friend. ‘Cora?’ Leyanne said aloud thus breaking the enchantment, she was again standing alone in the secluded wood where she already stood, she had recognised her instantly yet it made no sense that she would be here. How far had her mind run? Maybe 50 miles or so, Cora was a fool to think she did not have that kind of reach, she should know better but when did she come and settle in these parts? Cora was a Norse witch, a Volva, and she didn’t belong on these shores. Irritated by this new turn of events Leyanne felt her inner trepidation arise in ways it had not done for centuries. Not since the witch clearing back home in the 1500’s. A black time in her past when her entire coven that she had spent years amassing was wiped out by those religious zealots and their fear of her. What had they called her? Nicneven, Queen of Emphale. Oh those stupid mortals with their stupid stories. She had lost a stronghold of a hundred witches across the island in the months that followed. Heard every scream as they were tortured and burned. The one and only time in her life where she had felt any real depth of emotion for the loss of life and it had fuelled a rage which had burned for 500 years. Plagues, curses and wars as she sent her kinsmen into death as payback for what they had done to her followers. She had been distracted on her own path and had not been able to protect them. Turning over Cora’s face in her mind she knew she could not make any real contact at this distance, a haunting from afar could only give her a visual to whom had sent the raven and she knew if Cora wanted to talk she would never have sent the bird at all. Cora was a witch with limited skills, much like the rest of the weak among the mortals, it made no sense that she would be spying on Leyanne this way. Cora was considered a safe haven for witches across her lands, she never got involved in the politics between immortals and she most definitely never strayed into Leyanne’s business. That gut feeling she had on coming here was only proving to be right. Something was askew in the atmosphere and good boring witches like Cora were picking up on it too and all flocking to this quaint little Ohio location. She may not know what was going on, hence her need to have Leyanne followed but the fact a lowly wand wielder could sense it from across the waters spoke volumes. ‘Leyanne? I presume you want something’ Rinny’s sweet voice dripped with sarcasm on the other end so many miles away. ‘Are you implying that is the only time I call?’ Leyanne smiled, absent-mindedly twisting her hair, oblivious to the scattering of mini flowers beneath her feet escalating into full bloom around her. Nature always thrived at speed when she was not focused. ‘Yes…. Now, what is it? I’m rather busy’ Rinny was bored already, she had known this witch for too many decades, they had a friendship of sorts and a trust built on years of dependency. She only contacted her when bidding was to be done. ‘I love your quaint little title for my necessities Rinny, We all can’t be good little shape shifters with no interest in brews and potions can we?’ Leyanne sighed, ‘Okay yes, I want my things, my grimoire’s and maybe some of my clothes, If I have to stay in this god forsaken hell hole then I can at least make it comfy’ Noticing the flowers beneath her feet she rolled her eyes and stamped them out. Letting go of her hair she instead held out her hand to admire the large stone ring on her finger which caught the sunlight perfectly, its blue crackled depths of glass, such a pretty trinket made even more so by linking it to the soul of a lost friend. ‘So you are going to be there for a while then huh?’ Rinny was intrigued, Leyanne travelled constantly, only touching home for brief short stays before heading out into the elusive quest for purpose over and over, never before had she shown an interest in setting down a more permanent stay in one place that was not home. ‘Nonsense? Says the witch!’ Rinny laughed. ‘And what of those in the light? Those who are equally afraid to show true form. How will they react to me bringing the monsters out to play.’ Leyanne was tense, irritation evident in her voice. Rinny’s undying loyalty to her kind always at the forefront. ‘I would say stay safe Leyanne but we both know the only ones in danger are the people who cross your path….. have fun’ Rinny smiled down the phone, that hint of darkness in her always simmering . ‘Goodbye sister’ Leyanne held only warmth in her voice. Leyanne hung up the phone and slid it back into the pocket of her tunic, twisting her long pendants together and fiddling with the bangles and charms she always surrounded herself with, she watched the forest around her. The wind was lower now but the sun still high. She felt the presence of many a fallen soul around her yet none that stood out prouder than the rest. Nothing of interest here. With a throw of her dark hair she headed back towards the city. By moon rise Leyanne was back in her room at the Clairmont’s quaint white picket fence house, drawing back the curtains she unloaded her alter items from her wooden chest she carried wherever she travelled. First to cover the table by the window under the light of the moon with a black velvet cloth to absorb the rays. Her carved wooden trinket box engraved with a pentagram filled with her healing stones and runes that had travelled with her for her lifetime. Her crystal ball, more of a sentimental keepsake from a Romanian witch she met some hundred years ago and held a modicum of gypsy magic. The black candle and the white for balance both steeped in rose water and oil before burning. Her moon stone laid in the centre of the table between everything she needed to charge from the light and set the spell in motion. Her current Grimoire, a leather bound spell book of her travels and rituals that was filling up, engraved with a matching pentagram for protection from those who would take it. A bowl of rock salt for purification, a shallow rustic wooden bowl of soil for earth for the elements. The wind in the form of the breeze from the open window now blowing the flickering flames gently. The goblet, pure silver and tall and marked with the triple moon symbol filled with water to dignify all of the oceans and rivers of the world yet also as a weapon against a vast amount of immortals and finally her own personal pendant. A Triskele, the most powerful symbol of protection above all and a heirloom left behind by the man who sired her. Lastly her opal pendulum, silver pointed and long chained, its ability to lead her on the right path in times of doubt, she laid everything out as she always did. 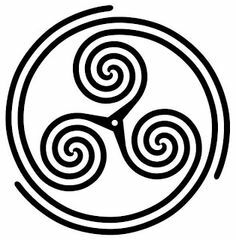 The moon ritual like charging a battery would not only give her renewed energy but revive her talismans and items to better aid her on her path. As she sat and meditated before her alter she felt the moon rising to it’s apex even behind closed eyes, the power surging through every cell and limb before her. She knew without looking her stone would be glowing and flooding out to the items laid before her, creating a perfect tapestry of light and recharging them all. ‘Dolores inferni circumdederunt me deam talem die plenae lunae reversurus est lava me servum tuum et lux renasci.’ she spoke loudly, carefully and clearly as she felt the light infiltrate her very soul, invoking her moon god to rejuvenate all her powers. With the surge came the visions, flickers of meaningless images and shadows, some unclear yet some so sharp and in focus but held no meaning. The images flitted through her mind until they settled on one dark form. A male standing tall and strong with his back to her, shrouded in shadow as he stood in front of a light source almost as bright as the sun so all he was, was a black dense shape. He wore a hat much like Indiana Jones and she could see the form of his jacket, legs and boots. He emanated strength and vitality and even without a face she could tell he was youthful. From the back she sensed no real danger only a strong urge of purpose and duty and then he was gone. Blinking her eyes open she could see the moon had passed its apex and the ritual was over, lacing her fingers together she muttered a blessing to her god before dipping her hands in the alter and cleansing herself. It was only then she saw the addition to her table. A small silver sun charm surrounded by a circle nestled in the salt. It had definitely not been there before and she could not derive any meaning from its appearance, cradling it in her palm she closed her eyes and tried to source its reason for existence. The sun gods were not givers of power for witches, they rarely bothered with any of the immortals. The sun a death sentence for many of the kinds who hid in the shadows. Her mind returning once more to the dark form of the man in the light, only this time the symbol was burning in the space on his back between his shoulder blades burning bright yet he stood his ground feeling no pain. Leyanne opened her eyes with a gasp knowing instantly what this vision meant. ‘Hunter!’ she cried breathlessly in shock, ‘Oh my god’ yanking her phone from her pocket she punched in Rinny’s number, fear gripping her heart in a way it had not done for almost 500 years. ‘Hey up, what’s wrong?’ Rinny’s cheerful tone suggested she had carried out her own moon ritual and was back in the sunny mood of a demon who had once again caged her darkness. ‘I had a vision and then a Talisman was left on my alter’ Leyanne’s voice was trembling, her hands shaking as she turned the tiny silver charm in her hand. ‘A hunter!…. 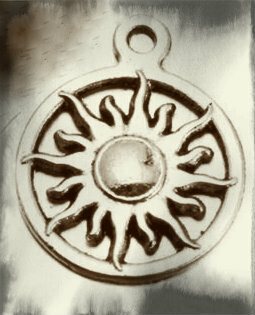 I saw one, he was standing facing away from me and this, this charm its a sun symbol like the ones they have emblazoned on their skin’ Leyanne took a deep breath, trying to calm her emotions. Her mind wild with scenarios. ‘That’s not possible Leyanne, the hunters were all made dormant, they have no memories of what they are and even still. Most of them are dead’ Rinny even sounded unsure, maybe even afraid like she should be. ‘A hunter can!’ Leyanne closed her eyes breathing slowly ‘Hence my part in helping the council remove the threat, it was my magic combined with all present which silenced them’ her chest felt like it was caving in, why would the gods allow a hunter back into their world and why would they let her see the intention. Her god Khonsu, ruler of the moon was where she drew her power, her only weakness was that of the ones who drew the power from the sun and of all the immortals there was only one kind who did. The hunters! Once a strong race of Aztec warriors whose only purpose was to wipe out those who defied nature’s laws by being immortal. The Aztec’s killed thousands in their wake, wiping out beings from the earth until the higher powers, a strong leader from each species banded together to fight back. Leyanne had been the most powerful witch among many powerful beings and it had taken all of their strength.They brought down the empire five hundred years ago and weeded out those with the super human strength and skills of the hunters, they killed most and those out of reach were laid dormant from afar. They either lost all memory and connection to their home and purpose or they fell into a deep sleep never to awaken. Why now? Why one raised hunter? As far as Leyanne knew the Hunters did not have immortality so any left straying should have died long ago, the blood lines considerably weaker would not hold the same effect. Is this why she had come here, that gut feeling inside. Was there a hunter awakening in the midst of the people of Newark? Some distant relative with abilities about to make himself known? If anything united a fear from both sides of dark and light it was the hunters, they were soulless creatures with no humanity. They had only the purpose of death. Grim reapers to immortals like her and Rinny. ‘What does this mean Leyanne?’ Rinny had the same tremble of fear in her voice as Leyanne had in her stomach.